I think writing this novel was very ambitious and for the most part it succeeds. Great central idea and there are many wayward threads which are tied together loosely. This isn’t a strand of predictability in any part of this novel which is refreshing. There is interesting comment on many spheres of human existence here. Some of the discussions of conceptual art are excellent along with religion, sexuality, politics and all of these are couched in an amusing way with scenes and dialogue from the main characters. So, why would I not give this novel full marks? Something about it is a little too forced – maybe the meta-fictional aspects. A couple of the characters are not quite rounded enough – they are more caricatures than characters. 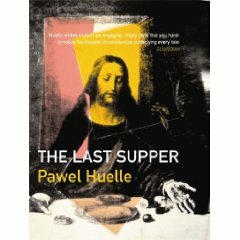 This may be intentional as the central premise of the novel is the Last Supper and a modern reproduction of the original so maybe all the characters in the novel can only be are caricatures. The other problem is that some of the dialogue is a little too modern. This may not be intentional and could actually be a translation issue. Though the review by the Guardian on the cover states that Huelle writes in an engaging ‘chatty’ style. This is a good thing apparently. Gosh, we wouldn’t want people to actually feel like they were reading a book instead of having a ‘chat’ with the author. So the combined weight of both these issues means that I won’t be using superlatives in the way that I did recently with Fado by Stasiuk. However the many good things about this book mean that I will read more by Huelle. Not in the next while however. I have read too much contemporary literature recently and really need something substantial to read. So, Tolstoy next.